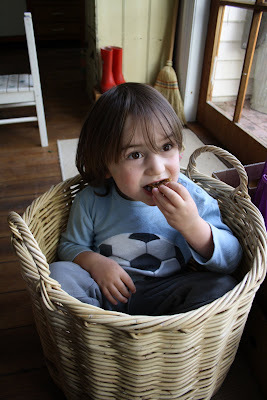 Boy in laundry basket eating mama's biscuits. Blogtoberfest:: a post a day in October thanks to Tinniegirl. The thing I find most annoying about posting comments on other people's blogs is the word verification which, if I as a genuine commentator can't read, how the hell could vicious web stalkers? Anyway the word for this comment is "presche" which really describes the picture of the boy and bikkie in basket as well!